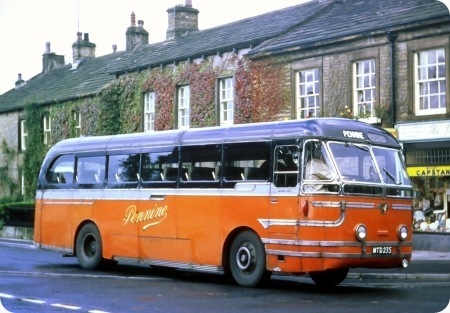 Here is a photo of 5895 YG, Leyland Leopard with Duple body, in the fleet of Pennine Motor Services, then in Gargrave. I took the photo in Morecambe in June 1970. Note the SALOPIA vehicle alongside. This vehicle was the last of four of this style, the other three being on Tiger Cubs UWX 277, 6108 WU and 9712 WX, so close inspection shows subtle changes over the years. The next new addition was 240 CWY, which Roger Cox posted elsewhere on the site a while ago. Herewith the conundrum as to what constitutes a C or a DP. Yelloway thought they were too bus like and only bought one batch but most things, including the entrance door, make this look more like a C than a DP. 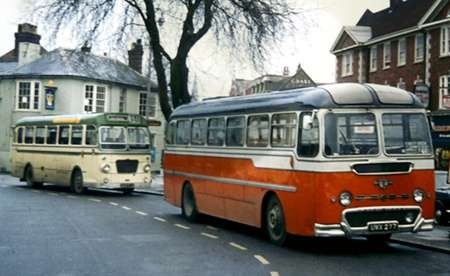 The same thing befell the Sheffield Transport Leopard/Burlinghams which were DP because they were based on a modified bus design rather than the Seagull – but they were really just as much coaches as their Weymann Fanfare and ECW contemporaries. Interesting point, David. From an operational point of view, the issue of whether a vehicle was a C or a DP generally depended on three factors: use, seating and livery. As OMO became more prevalent, provincial operators realised that front entrances enabled relatively easy and cheaper downgrading, especially if the eventual fate of new vehicles was considered when they were bought. As for external appearance, a sensitive compromise was needed: too bus like, and passengers might feel they were being offered second best if they expected a coach; too coach like could mean problems displaying stage carriage destinations later in life. I’m not sure if it was still known as the ‘Donnington’ by this time but it definitely improved with age (like we do!) When it was first introduced, it had too many shallow side windows, perhaps a throwback to the old ‘Roadmaster’ design. This one, with just five deeper side windows is a great improvement and looks very nice. Yelloways were of the original design which would explain why they didn’t like them! The five bay version was known as the Donington 2 and was used by, among others, MacBraynes. I produced a resin kit of it in fact! The design was built by the Duple Midland operation and was effectively superseded by the Britannia, which was very popular and shared the same front grille mouldings. The correct spelling is Donington with one "n" – the body was named after the Donington Park motor-racing circuit close to the Duple Midland works in Loughborough. Donnington with "two ns" is in Shropshire. As you say this version of the Donington (actually its third incarnation since the first prototype was built in 1956 – the first version was built from 1957-58 and lacked the "chain" motif in the front panel) is by far the most attractive due to the deeper windows. I’m left a bit confused by the comment that "the Donington was replaced by the Britannia". The Britannia design was first introduced in 1956 and the last were produced in 1962, the same year in which the Donington was deleted from the Duple catalogue. Both models were replaced for the 1963 season by a choice of either the (Hendon built) Commodore or (Blackpool built) Commander. Dual purpose options then became the preserve of the Willowbrook subsidiary and were built to "BET standard" design. Yes Neville, I assumed that the draughtsmen who wrote "Donington" on the drawings knew what they were doing! I didn’t actually say it was replaced by the Britannia but my choice of words was perhaps unfortunate. What I meant to convey was the relative popularity of the Britannia as against the Donington leaving the latter with fewer sales. As you will no doubt tell us there were at least three versions of the Britannia as well! Reference the comment above about Willowbrook model names being recycled, Park Royal also did this with the name Royalist though the second version was anything but successful, not helped by being initially built on a second-string chassis rather than a front line player. You’re quite right, Andrew, there were several versions of the Britannia. The original version, brought to market in 1956 to replace the Elizabethan, had a curved waist-rail and introduced the "chain motif" to the Duple range. All of this first version had front entrances, but were offered alongside the Britannic which had a central entrance and retained more of the styling of the Elizabethan. The Britannic was quietly dropped from the catalogue in 1957 and few were sold. The second version of the Britannia formed part of a new range of designs exhibited at the 1958 CMS at Earls Court and shared many components with the new version of the Super Vega built on Bedford SB chassis. Basically similar bodies (but at that stage nameless) were also offered on Ford and Commer chassis. As far as I can tell from my own records the Mk II Britannia was only available with a front entrance at first, but from 1960 onwards a new central entrance design with a much more curved profile at the front end was also offered. The most famous of these were probably the examples operated by Samuelsons in London and St Helens Corporation. There were minor detail changes to both front and central entrance versions in 1961, but you really have to look hard to see the difference – a tiny destination blind incorporated into the front bumper is the most visible clue. By 1962 orders for both Britannias and for the Donington had reduced to a trickle due to competitive pressure from the much more stylish offerings from Plaxton and Harrington. Duple realised that it was losing its share of the heavyweight coach market, dumped the Britannia, Donington, Willowbrook Viking and Viscount, and the entire sadly bastardised Burlingham range from the catalogue, and replaced the lot with the Commander (with vertical window pillars) and the short-lived Commodore (with a "Bella" style raked back pillar towards the rear). Sorry to go on, but as you might have noticed I have a thing about pre-1965 coach designs! Externally all forms of the Donington look like buses to me, except when dolled up with Britannia/Vega trim, as here http://sct61.org.uk/ It’s amazing what a few bits of metal and an association of ideas can do! Castle Donington (one n in the middle!). The village has long suffered having people mis-spell its name, just as many folk think it is in Derbyshire because of the postal address, but it is in Leicestershire. The Duple Donington body. Duple purchased the business of Nudd Brothers and Lockyer in 1952, renaming it Duple (Midland) Motor Bodies. Nudd’s premises were a hanger on the former Castle Donington airfield, now East Midlands Airport. Nudd had experience of metal framed bodywork, hence the Duple interest and the name of the design of the Duple metal framed body. The technology of the time may have resulted in the rather angular design and the small windows used at first. I found the comment on ‘DP’ v ‘C’ interesting, as I’ve never been quite sure where the difference lay, and there are clearly several ‘grey areas’. One of my main questions is how the Ribble PDR1 ‘White Lady’ Atlanteans justify the designation ‘coach’, at least among enthusiasts. The roughly contemporary Leopards with BET-style bodies by Marshall and MCW are always referred to as ‘DP’, though in terms of comfort, style or usage there was little to distinguish them from the Altlanteans; if anything the Leopards were marginally more coach-like internally and ventured further afield. But both types were effectively buses fitted with headrest seats and luggage racks, and consequently had the claustrophobic feel of being packed with a lot of stuff that they were not really designed for. Both were mainly used on relatively short inter-urban express services, at least one of which (the X43 Manchester-Skipton) was actually a stage carriage route at its country end. Doses it really just boil down to the double-deckers’ almost all-ivory livery, compared with rather more red on the saloons? But then in NBC days the Atlanteans (by then well past their unimpressive best) were given service bus livery, while the Leopards got the DP treatment! Was it just that the Atlanteans hijacked the justified ‘C’ designation of their upmarket cousins, the ‘Gay Hostesses’? And as for the earlier generation of Titan ‘White Ladies’ — though admittedly I’m too young to remember very much about them — how could anything lowbridge ever really be called a coach, however much chrome you put on the outside? Both photographs by ‘unknown’ if you took this photo please go to the copyright page. There has been some discussion on another posting about the former Leyland demonstrators, MTC 757 and MTD 235, the latter being still with Pennine and mentioned in the new PSV Circle listing on preserved buses. I have "bought" slides of these two, and I know when and where they were taken, but I’ve no idea of the photographers. 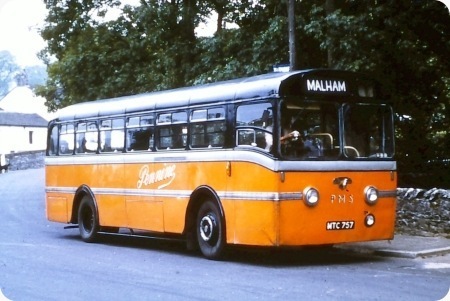 MTC 757, the bus version, is seen in Malham in June 1964. MTD 235 is seen in Gargrave in September 1967. 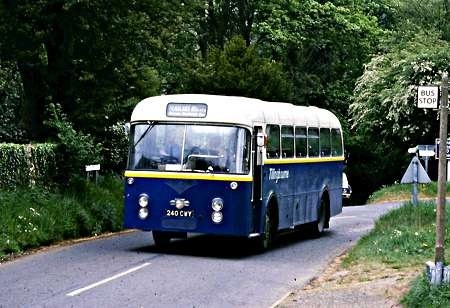 MTC 757 had a Brush bus body, while MTD 235 is quite clearly Leyland’s own. ‘The Dalesman Cafe’ on the right of the lower shot was still thriving when I was last in Gargrave a few months ago! Wouldn’t you put the dates of these two the other way round? The bus looks remarkably modern and simple for 1950- even the peaked front dome (or is that a trick of the light?) Could it be a rebuild? On the other hand the Leyland (export?) body looks a bit 1940’s Detroit at the front, especially that chrome "dribble". Joe, it’s definitely a trick of the light – MTC 757 did not have a peaked dome, and was a very neat looking bus for the time. It was built in 1950, and acquired by Pennine in 1951. They withdrew it in 1967 and it is believed to have been scrapped. MTD 235 was the prototype for the Leyland Royal Tiger coach body, and as originally built it did not have the multi-windowed ‘lantern’ type windscreen arrangement seen here and familiar on all the production examples, though it must have been modified very early on, as all the photos I’ve seen of it with Pennine show it as it is here. I must rack my brain (quite difficult nowadays) and try to remember which book I have that shows it in its original form and report back. Don’t hold your breath ! I had – please note the past tense! – black and whites of both these vehicles, and taken at Lancaster Bus Station. MTC most certainly did not have a peaked front dome. I have a copy of the Pennine history by Donald Binns in collaboration with the operator, which has a photo of her on page 49. The caption includes "It was scrapped in August 1967 after 16 years service and with 825,000 miles on the clock". The dates given in the posting would seem to be correct. MTC 757 was a Royal Tiger PSU1/13 with Brush B44F body built as a demonstrator in 1950, and bought by Simpson of Gargrave t/a Pennine in 1952. Brush ceased building psv bodies in 1952. 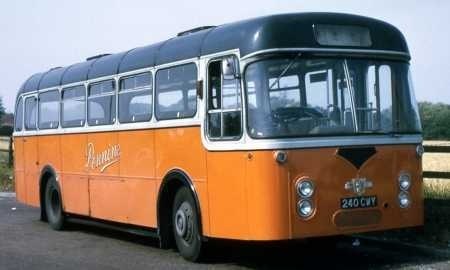 MTD 235 was also a Leyland demonstrator, and it carried the standard Leyland 41 seat coach body for this model, though the chrome trim was adapted to meet customer choice, and some examples did not have the "swept under" front panelwork. This body continued to be available up to the time that Leyland closed its coachbuilding facilities in 1954. The PSU1/13 version of the Royal Tiger had the horizontal O.600 engine coupled with a four speed synchromesh gearbox and vacuum brakes. MTD 235 is still owned by Pennine and is kept at Barnoldswick and is worked on when time permits. The Brush body was a nice design and must have been one of the very earliest on an underfloor engined chassis (apart from BMMO). Quite different to those supplied to Yorkshire Traction/Woollen. Presumably it was 7ft 6in wide? Chris, MTC and MTD were both to the usual 8ft width for underfloor engined vehicles of the time, so far as I am aware. Think 8′ was standard width for these underfloors. Although they still existed quite recently as a heavy engineering and railway manufacturer, Brush effectively became Willowbrook in bus terms. [Not sure who bought whom.] The next Royal Tigers for Tracky were Willowbrook – but built by the same men in the same factory. Several Royal Tigers were built to 7ft 6in width, it was offered by Leyland as an option. Hebble and Devon General had some Willowbrook bodied examples. Brush are still very much in business, in Loughborough adjacent to the railway station. It was just their bus building activities which they disposed of in 1952. All production was then transferred to Willowbrook including some double deck Daimlers for Derby which were in build at the time and Brush designs disappeared almost immediately. Willowbrook existed in Loughborough from 1931, totally independent of Brush. They occupied the retail site now known as Willowbrook Park. Brush voluntarily quit the bus body building enterprise in 1952, but locals tell me that their designs were passed to Willowbrook. As Chris says, Brush are still in business, but they are a mere shadow of what they once were, and are no longer the town`s biggest employer. Once upon a time, they were the second largest tramcar builder in the UK, and that was just part of their total business! What about Pennine though! Still in business, and they have seen it all and survived it all, and still continue as a small independent. I remember them well from my courting days, with wife to be living past Settle, on the Pennine route! Good old Happy Days are getting even happier! I thought Pennine only had a garage in Skipton, but from Philip’s comment above, and from looking at their current timetable showing some early morning services starting in Barnsoldswick, I realise they have a garage there as well. Does anyone know how many vehicles are accommodated there; presumably only 4 or 5? The Pennine garage at Barnoldswick was acquired with the business of Ezra Laycock Ltd in 1972. As an ex-Laycock employee I ought to be able to confidently tell you the depot’s capacity – I can’t quite do that, but I think that the answer is five, although in Laycock days vehicles were parked outside as well. According to the timetable three buses start and finish at Barnoldswick, so that is presumably how many operational buses are kept at the depot. I did have it in my head that MTD 235 had been moved to Skipton, but I may have imagined that bit. As far as I am aware Pennine also continues to use the small depot at Settle, capacity two vehicles. I notice that Pete Davies has mentioned (on the Pennine LWY 702 posting) that MTD 235 is indeed now resident at the Skipton depot. All is explained, at last. The section about MTC 757 & MTD 235 appears under a total of four headings – Brush (bodybuilder), Leyland (bodybuilder), Pennine (operator), and Leyland Royal Tiger. Only under the heading of Leyland Royal Tiger is there a section devoted to Pennine’s LWY 702, and it is at the foot of that section where Pete Davies has mentioned that MTD 235 is now at Skipton depot. I would not expect LWY 702 to be mentioned under Brush, of course, but I am surprised that it does not at least get a mention under Pennine (operator). 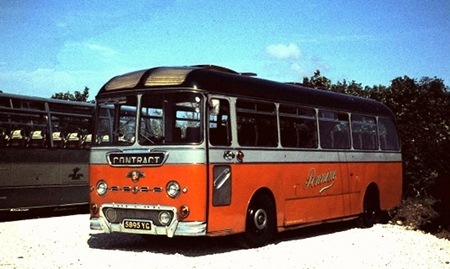 As to whether it should appear under Leyland (bodybuilder) or even Leyland (chassis builder), I suppose you will have to draw a line somewhere regarding what gets included and what doesn’t, there were an awful lot of Leyland buses manufactured. In passing perhaps I could mention that I noticed that under the heading of Leyland Royal Tiger Cub, only one of the three sections actually relates to an example of that model. The other two refer to the infinitely more common Leyland Tiger Cub. Should I trawl through the other headings checking for similar errors/anomalies? It would beat counting sheep, I suppose. The comments engendered by entries to this Forum frequently range far and wide, often well beyond the strict confines of the original submission. We have all had at least one reprimand, not, be it noted, from our webmaster, for straying from the initial subject, but that is entirely within the spirit of this site. The wealth of interest, information and detail that emerges thereby is invaluable. I think that we should go on regarding ourselves as a bus enthusiasts’ equivalent of Dr. Johnson’s Literary Club, with free ranging discussion. Cross referencing every point made in the "comment" columns would be a nightmarish task. Let us just be very grateful for this splendid site. Agreed, Roger. It’s worth remembering, too, that, although not as good as cross-referencing, there is a search facility on the website which I’ve found useful a couple of times. I think most of us form a loose group of cyber friends with a common purpose. I think that overrides any jobsworth tendency to pedantry – and that comes from one of the world’s biggest pedants! Contrary to what I stated above, it seems that the section devoted to LWY702 actually appears under all the headings I mentioned – I hadn’t realised that many of the headings lead to multiple pages. It does not help, of course, that my search engine (google) only picks up words and phrases which are contained in the first of those multiple pages – not the second and subsequent. On the Pennine (operator) pages, Chris Wright and Orla Nutting comment on the forthcoming closure of the company. There has been some confusion about MTD 235. Some sources say she’s at Barnoldswick (spoken locally as Barlick) and some (including me, based on reports I’ve had) say she’s at Skipton. To a degree, both are right and both are wrong! On withdrawal, she spent MANY years gathering dust at Barnoldswick garage. About 2 years ago, she was moved to head office with a view to start of restoration. The inspection was duly undertaken and it was found to be [I quote] ‘a massive job’ which would divert too many staff hours, so she’s back at Barnoldswick, apparently with one of the Leopards new to Ezra Laycock. I suspect that a number of readers will be concerned about the future of MTD maybe she should could go either to the Leyland Museum or to the one in St Helens if the family don’t keep her. The ex-Laycock Leyland Leopard reputedly stored at Barnoldswick depot can only be OWY 197K, since that was the only Leopard ever owned by Laycock’s. An interesting point is that throughout the few months of its time with Laycock’s, and into Pennine ownership, it carried the incorrect registration OWY 179K. Thank you, David, for your comments about the Leopard. In the Donald Binns book about Pennine, there are two photographs showing her with OWY 197K, but the listings in the book show both registrations! She is shown in the book as being stored at Ingleton, but that is clearly out of date if my information from company staff the other day is correct. Pete. I paid my respects to Pennine on the last day 16th may I Actually wrote to Maurice Simpson wishing him well for the future and how sad it was Pennine Motors was closing down. I suggested MTD 235 should be restored in memory of his father and the company and what his plans are for the vehicle. Work was carried out on the brakes and other bits and pieces the chief engineer tells me, however she is to be towed back to Skipton in the coming weeks but what the future is it is not clear as yet. Thanks, Mark, for your update. Before I retired, I worked in the passenger transport team of Southampton City Council, dealing with the local operators over aspects of their services. The national concession scheme was just coming into use. My managers commented on several occasions that the regulations said that the level of reimbursement must be strictly neutral, in that the operator must be no better off and no worse off through taking part in the scheme. The reports I have read in various places all suggest that North Yorkshire County Council have a different view. The point made by Pete Davies was first specified in the Ridley 1985 Transport Act when each local authority had the power to determine a concessionary fare scheme. This led to wide variations throughout the country, and some authorities, of course, chose not to offer any meaningful scheme at all, which was one of the reasons why the Labour government, in reality, John Prescott, decided to ensure that mandatory schemes were available everywhere from 2001. This was followed up in 2007 by a national scheme for England. The Welsh and Scottish administrations pursued their own policies. This new scheme maintained the requirement that "Travel Concession Authorities are required by law to reimburse bus operators for carrying concessionary passengers, on the principle that the operators are "no better off and no worse off" by taking part in concessionary travel schemes. The aim is not to subsidise bus operators, but to pay for any increased costs that they have incurred". The legislation goes on to say, "The national bus concession in England is available at any time on a Saturday, Sunday or bank holiday, and from 9.30am to 11pm on any other day. TCAs are able to offer concessionary travel outside these hours on a discretionary basis". I understand that North Yorkshire allows the passes to be used from 9am until 6am the following morning, which is entirely lawful under the clause stated above. The situation in respect of the depot premises is as follows. As Mark McA says, the future for MTD 235 is not clear – it looks even less clear now. We can only hope that it will be, as suggested by Pete, donated to one of the established museums. Quite right, Roger, but it’s the amount of reimbursement that seems to have upset matters in this case. Re MTD 235 – can anybody give me an update on this coach’s current condition and location please? It appears to have been offered for sale on Ebay in 2014 but the highest bid, just over £2K, didn’t meet the reserve price. Since then it has been off the radar. "Just over £2K", Mike? That’s just silly, given the nature of the beast. I’d have expected another ‘0’ on the figure . . .
That’s the reality of Bus Preservation lots of effort/money but nothing like the financial return of vintage cars. Sadly Pete, the generation of enthusiasts that remember and appreciate this era of classic vehicle are getting on in years and fewer in number, and probably feel that it is a bit late in the day to start getting involved in such a substantial and expensive restoration. The majority of active preservationists nowadays are more into the vehicles of their youth – such as Nationals, Olympians and Metrobuses, and even more recent types than those. I attended the open day at the Dewsbury Bus Museum the other week and thought I’d sample a few rides on the free bus service into Dewsbury and back. I rode on the superb recently restored West Riding PD2 and then the West Riding PS2 but was surprised to note that though plenty people were photographing them, there were relatively few that chose to ride on them, whereas the Olympians, RELL, Leopard and even the virtually new Arriva Enviro Whateveritis were packed out with excited punters. Time moves on, and so will we, and I fear for the long term future of many of our favourite classic buses. Re MTD 235. It did not meet reserve on eBay in 2014 (highest bid £2250) so presumably its still with Simpson (t/s Pennine Coaches) Skipton. MTD 235 once again on Ebay. MTD 235 has been sold on in Yorkshire. I can report that restoration of ex-Pennine Royal Tiger MTD 235 is continuing with the mechanics receiving a thorough overall and work commencing on the body. It is hoped that it will make a return to the road one day soon, keeping fingers crossed! Good news indeed Phil-thanks for the report. I am currently restoring the ex-Pennine Leyland Royal Tiger MTD 235 – has anyone got a destination blind for this or any Pennine posters or notices or timetables that were displayed in their buses in the 1950s, 1960s or 1970s? I will be pleased of any help or copies of anything that will add to the restoration. Thank you, you can contact me through this website. The only blind I have seen also covers 1972, 1983 and 1986 changes and includes the former routes of Laycock, Skipton and the ex Ribble locals and Burnley etc. 1950’s’/1960’s when MTD was in main service then the range was small. Therefore would suggest only needs to include Malham, Tosside, Morecambe, Lancaster, Ingleton, Gargrave, Settle, Skipton, and Contract. On further materials-assume, you already will have the Donald Binns 2000 book called Pennine Motor Services that includes many timetables. Hope this helps and that your worthwhile project continues on. Any ideas when it might be completed? I’m trying to locate the Leyland Royal Tiger MTD 235 mentioned in your website. My dad is a retired bus driver and it’s his favourite bus. I’m trying to arrange just to see it really. Thanks for your info on MTD 235 destination names that will be useful, at the moment it has no blind gear as this must have been removed some time ago, so I am trying to find replacement blind gear (if anyone has some!). I haven’t found that book on Pennine but I hope I’ll find it some day. I have found some old Pennine excursion flyers which I hope to make use of. Restoration continues albeit slowly as I’m finding much of the rear end wood frame has decayed or is missing and this is not my favourite job! I am part way through rewiring the coach as much of the original is in a very poor state. I think it will be a while yet before it is finished, but if anyone has any memorabilia, old Pennine notices, posters or unpublished photographs I will be pleased to know! In the 1970s, when I was a manager at London Country, to keep my hand in I used to undertake weekend driving jobs for independent operators. One of these was Tillingbourne, then owned by Trevor Brown, who also dealt in second hand buses and coaches. As well as driving buses on normal service, I would undertake collections and deliveries of vehicles to/from his dealer’s stock. One such trip was the collection of 240 CWY, a Leyland Leopard L2 with Roe B49F body from Pennine of Gargrave (aka Simpson of Gargrave) in August 1975. The picture was taken during a stop "somewhere in England" en route between Yorkshire and Gomshall, Surrey. This Leopard was an early example dating from May 1963, and the Leylands of that vintage always had heavy controls, but I found this Leopard rather nicer to drive than the Halifax examples with very stiff gear change linkage that I had experienced some ten years earlier. 240 CWY served in the Tillingbourne fleet for two years before being sold in October 1977, reputedly to Berresford of Cheddleton, though I cannot find any record of it being run by that operator. What an attractive machine this was, and made even more so by Pennine’s stunning livery. I once rode on this vehicle all the way from Skipton (where I’d arrived from Manchester on a Ribble "White Lady" Atlantean) to Lancaster. One of the great bus rides of the day, but sadly no longer available. The last Pennine bus I travelled on was last October between Skipton and Nelson where I connected with a Transdev ‘decker to Manchester. Still a double-deck coach on the Manchester service (although no longer running through to Skipton), still the same lovely Pennine colour scheme, but the Pennine vehicle was a Dennis Dart. Profoundly not the same as the vehicle above! Neville I believe they have a 100% Dart fleet at the moment. I went for a trip on one of them to Burnley and back a few weeks ago. Nice to see them soldiering on, despite competition from Transdev, perhaps 3 journeys per hour from Skipton to Burnley aren’t really needed! 240 CWY did reach Berresfords at Cheddleton by very early 1978. It was never operated by them but parked up at the back of the garage where it remained basically complete until the site was cleared in the Summer of 1987. Is it possible that the Halifax examples were quite a bit newer when you drove them and would therefore not be as worn? – on saying that I drove PJX 232 which was a ‘B’ fleet vehicle and was allocated to ‘out of town routes’ and the gears were quite easy to select. driving PJX 35 from the ‘A’ fleet was quite different – the gear selection was some what stiffer. 240 CWY had a cousin in the fleet, LWU 499D. I have vague (and only vague) recollection that what is generally known as Simpsons had members of the Windle family on the operating discs in the 60’s. At what point, does anyone, know, did the Simpsons become involved, and are they related to the Windles? I enquired above if anyone knew if there was indeed a link between the Simpsons and the Windles, and what that relationship was. I have now managed to obtain a copy of the history of Pennine, published in 2000, which indicates they were in-laws. Peter has views of MTC 757 and MTD 235 coming in a few weeks, when he’s worked his way through the pile of contributions from others. Am I alone in seeing a resemblance between the front end of this vehicle and that of the Aldershot & District coaches (bodied by Roe’s sister company Park Royal) which used to operate their London services? Could it be that it was assembled from Park Royal components and "badged" as Roe so as not to offend the sensibilities of good Yorkshire folk? The only other "Roe" examples of this styling that spring to mind are the service buses produced for Leeds. Any former Roe employees from the 1960s out there? Neville, no you’re not alone but it’s hardly surprising since Roe built Park Royal designs on Park Royal frames almost from their take-over. Lincoln had Tiger Cubs which could easily have been PRV/Monocoaches at sight. Until 1968 Roe built all composite bodies to their classic design but also helped Park Royal, out when there were capacity problems, by building their metal framed designs. Don’t think we’re actually that sensitive in Yorkshire. Sheffield had lots of Park Royals from 1963 to the PTE take-over in 1974 and the 1963/4 Regent Vs were almost identical and contemporaneous with the Tracky PD3As of 1965. Hasn’t it got the traditional Roe raised waistrail? and wouldn’t that indicate composite construction? Whereas, I’m assuming, the A&D/EKRCC/Birch coaches built by Park Royal would have been of BET-standard steel-framed construction. That aside, the window length was longer, the rear window a curved two-piece structure, and the rear roof dome a different shape. There is some resemblance around the front windscreen though – perhaps Roe did take some inspiration in certain ways, although I’ve just realised that this style of Roe body probably pre-dated the Park Royal (semi) coaches and that any influence might have been in the other direction . . . suitably updated and lengthened. If this http://www.flickr.com/ is the body that Neville has in mind, I don’t think it’s the same one, though it does seem to have the same windscreen. Yes Peter, that’s the one. It was the front-end part of the design I had in mind. Didn’t Great Yarmouth have something similar on Daimler Freelines in the early 60s? This raises another question – why were Gt Yarmouth buying Freelines so late in the production run and a decade after most other UK operators had given the design a distinct thumbs down? Coming to David’s point, the reason I suggested the "badge engineering" part is that it certainly happened in Lancashire – I’m thinking of Darwen Corporation’s insistence on having AEC designs badged as "Crossleys". I would never disparage Yorkshire folk, despite the unfortunate events of 500 years ago. In my ideal version of reality Lancs and Yorks would combine to form a new Pennine nation. We are the salt of the earth! I think the answer to your question can be summed up in one word – Hilditch. Geoffrey Hilditch had firm ideas on what he wanted in a bus and since in those days Leyland had a rather ‘take it or leave it’ attitude, he would go elsewhere if he thought he could manipulate them into producing what he wanted. So at Great Yarmouth, wanting trusty Gardner engines in his single deckers to match his double deckers, he got Daimler to revive the Freeline. At Halifax he had Dennis remodel the Loline to meet his needs – with disastrous consequences as it turned out – and then went to his old employer (briefly) from his home town and got them to design the Pennine RU (also a disaster). Later at Leicester, disenchanted with British Leyland and the Metropolitans, and really wanting a Fleetline replacement, persuaded Dennis to produce the Dominator. The last Great Yarmouth Freelines had more of an Alexander type windscreen, similar to the ones Roe had used on their (and others’) Fleetlines, and on the later Doncaster Royal Tiger Cubs. P.S. A new Pennine Nation eh ? Hmmm………maybe, but there would need to be an East Pennine and a West Pennine I feel. Yes, but Yorkshire born and bred – and proud of it – I did my degree and first jobs on t’other side. I’d be easy with Pennine Nation. [We have divisions and had Ridings and even Sussex has an East and a West.] We have more in common than not. Thanks for that explanation John. I’d forgotten that "Gortonian" was GM at Gt Yarmouth. One of Britain’s truly memorable bus fleet managers unlike say Edgeley Cox of Walsall who I always thought was just plain barmy! On an even more flippant note, despite the Pennine/Skipton connection I would suggest that the capital of our new Pennine Nation should be in Todmorden – part of the town used to be in Lancashire after all. 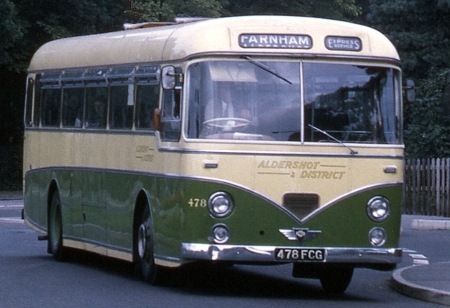 Neville’s point about the resemblance between the Pennine Roe body and the Park Royal coaches of Aldershot and District may be seen in this view of A&D Reliance 478, 478 FCG, with C49F body delivered in 1963. These fifteen vehicles were of the 4MU4RA type with the AH470 7.685 litre engine coupled to a six speed constant mesh gearbox. It would appear that the windscreens are identical, but the waistrail level and driver’s side window are set at a lower level on the Park Royal. This picture was taken in Farnborough, where I then lived, in August 1969, by which time the magnificently florid traditional Aldershot and District fleetname had been replaced by the simpler style shown. I think the A & D coaches (and livery) looked better than the East Kent – good in itself – but I still prefer the 2U3RA, despite its troublesome AH590 engine. I drove 240 CWY when the vehicle passed to Tillingbourne Bus Company which sadly abruptly closed a few years ago. I would regularly drive part time driving for them based at Gomshall railway station where they operated local village services into Guildford. 240 CWY was heavy on the steering but a good bus to drive. I spent many a happy hour trundling in and out of Guildford to Peaslake and Farley Green making sure I got in front of the London Country MB’s running into Guildford in the 1970’s. I went on to have my bus company Leisurelink at Newhaven. Attached is an image from my slide of 240 CWY in service with Tillingbourne leaving Gomshall for Peaslake and about to cross the level-crossing on the Guildford to Dorking line. I recall that Tillingbourne acquired 4 vehicles from Pennine, a second Leopard LWU 499D and a pair of Tiger Cubs 6108 WU and 9712 WX. Nearby Tony McCann of Forest Green also acquired a Tiger Cub UWX 277 which ran in Pennine colours for some time. I collected one of those Duple Donington (often misspelt – only three ‘n’s in the word) DP41F Tiger Cubs PSUC1/2 from Gargrave, Keith, and also drove them all (another PSUC1/2 Donington came from Thomas, West Ewell) in Tillingbourne service. The Tiger Cub was quite a nice machine to drive, certainly superior to the early Halifax Leopards, and the Donington was one of Duple’s better bodies in my opinion. I have a picture of one in Tillingbourne livery somewhere. I must seek it out. The Guildford – Dorking – Redhill railway line is a delight, following as it does the foot of the North Downs all the way. For seven years I used it to get to work between North Camp and Reigate – BRCW Type 3 loco hauled in the morning, and Tadpole demu unit back home in the afternoon. Happy days indeed. I worked outside Guildford station in 1961/62 and reczll the extensive steam depot there, unusual in an otherwise electrified area. Around 1980, I took a Tadpole from Guildford to Ashford, along a disturbingly straight track! The ‘Tadpoles’ coaches never matched, being cobbled together from narrow straight-sided Hastings stock and surplus rounded Tyneside stock. Some of the Type 3’s were narrow, too, to squeeze through the Hastings tunnels! Will look forward to seeing the photo, Roger, if you can find it! I can now attach an image of UWX 277 in Horsham Sussex with Tony McCann. Behind is the former Western National SUL with Tillingbourne. Not a good advert for independent operators in those days!!!. Apologies for the poor photo but there were problems at the time with film and the slide has faded. There is a better – black and White photo [not mine] – in Laurie James’s book on Horsham’s Independent Bus Services and apparently UWX 277 was nicknamed the Orange Box.